In this post I want to share with you another butterfly wings manicure I made with the Nailz Craze NC01 plate, this time I did a neon version to suit the summer time. I had also attempted to film a video tutorial for you to demonstrate how I work to apply this design, but unfortunately this was quite a bad turnout and I realized that filming tutorials is just too hard for me. I get all so nervous and self consensus, everything is going so wrong, it's just a complete disaster! I might ask someone to try and film me in the future, maybe it will go better, but for now I will stick to creating manicures and taking photos of them, and maybe occasionally make pictorials. Lucky for me (and you!) 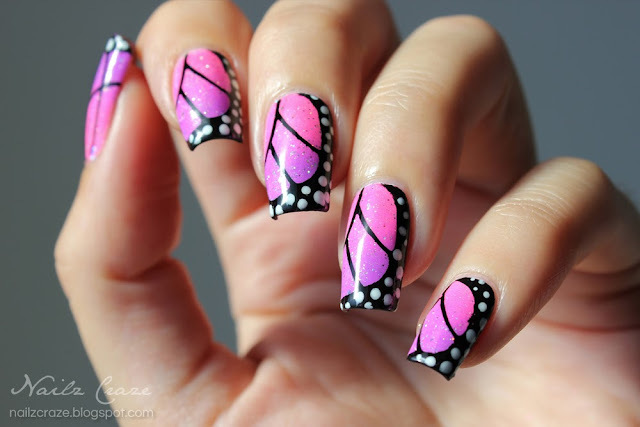 I found an awesome video tutorial made by missdrea33 on YouTube, demonstrating how to create the butterfly manicure in a few easy steps. I have to admit, I couldn't have done it any better myself! She does such a great job explaining how to use the plate and the stamper, how much polish to use and how to work best with the scraper. Her work technique is the same as mine, so I defiantly recommend you to check this butterfly wings stamping tutorial to learn how to work with this plate and get good results. If you are relatively new to stamping, it will take a bit of practice to align the design perfectly, and you might need to make a few touch ups, but I think it's worth giving a try to get these pretty wings on your nails. To create this design I started with a white base (Wet n Wild French White Creme), and picked two of my favorite neon colors for the gradient - China Glaze Shocking Pink and That's Shore Bright. I applied one coat of the beautiful Barry M Diamond Glitter to add some sparkle to my design. 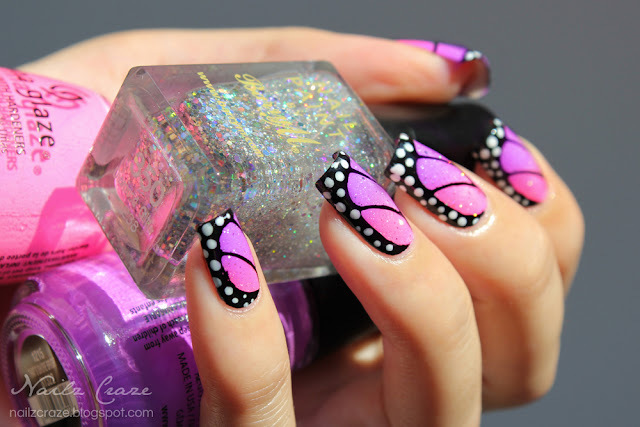 I stamped the butterfly wings from Nailz Craze NC01 plate, using Konad's Black stamping polish. For the white dots I used the same white polish as I used for the base. To seal the design I applied one thick coat of Poshe Top Coat. It was quite difficult to capture the neons on camera, the colors just didn't look true to life so I had to work on the photos a bit to get a better result that will reflect the real colors, and still the colors were much prettier in real life. This is actually my third recreation of the butterfly wings design, and it's kinda funny to see how much I improved over this past year and half, when I first started blogging. The first time I created this design was a year and a half ago, when I just created the Nailz Craze brand and the first plate, and I was quite new to stamping then (geez, what's with the huge watermark?!). The second attempt was a little less that a year ago, which I was also pretty proud of at the time, but looking back, I totally like the current version on this manicure. I hope that showing you these old designs of mine will make you keep going and practicing even if you don't get it perfect at your fist attempt. And don't forget to have fun! After all, it's just nail art. I'm happy you find it useful and I hope it will help you work with the plate easier ;) Good luck! Thank you dear! I appreciate this! I recently bought this plate so Its great that you return to the old designs and show new inspiration! Thanks, I hope you will enjoy the plate and have fun! I always wanted to have this plate... who knows some day I'll get it.. I use a squishy stamper (XL stamper that you can find on eBay) and it seems to help. 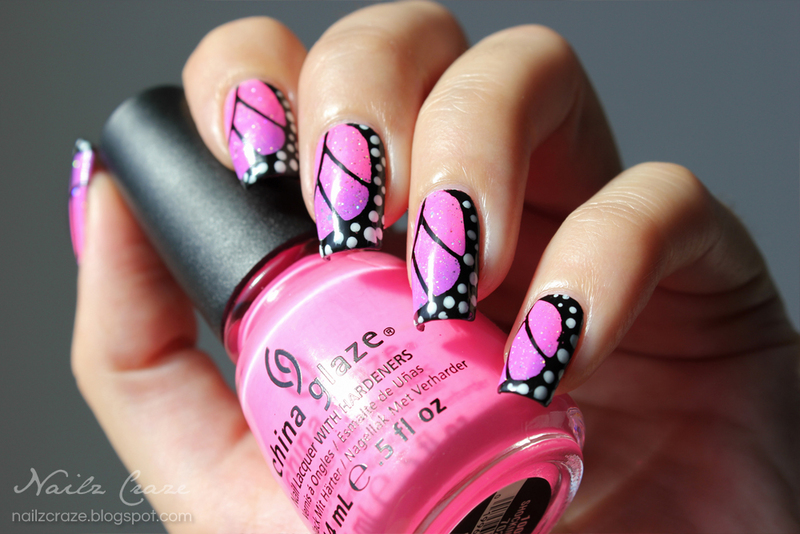 I stamp very carefully and tap the polish after stamping to make it stick to corners and curves. Hope this will help you too. I love all the creations you made with this stamp! It is a stunning pattern and I hope to try it one day :). Very original, it's amazing - jeweler work! So very bright and pretty!